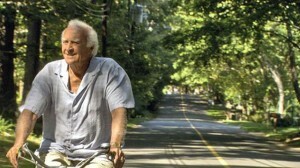 Robert Loggia takes it on the road in Harvest. Monterey Media released the independent film Harvest, starring Robert Loggia (Scarface), Victoria Clark (Main Street) and Jack Carpenter (I Love You, Beth Cooper), on DVD on June 21, 2011, after a quick release in theaters on May 6. Set one summer at a beautiful Northeastern shoreline home, the drama movie follows three generations who gather around their patriarch (Loggia), who has cancer, while his wife (Barbara Barrie, Breaking Away) suffers from dementia. Their daughter Anna (Clark) a divorced woman, cares for her parents in their home, where she still serves as mother to her college-age son, Josh (Carpenter). Josh has two uncles, one still living in the paternal home (Peter Friedman, The Messenger) and one who is a local politician in the town where they all live (Arye Gross, TV’s Castle). Years of tension, resentment and betrayal bubble just beneath the surface of the family, which is just barely hanging on to what it was — and what it is — to each other. Josh does his best to hold them all together. Written and directed by Marc Meyers, Harvest ran in theaters across the country, including New York, California, Florida, Delaware, Kansas, South Carolina and Oregon. The DVD, which features bonus interviews with Meyers and actors Carpenter and Arye Gross, carries a list price of $26.95.